Beautiful sights: Situated against a breathtaking backdrop of tree covered mountains and the calm blue waters of the Mediterranean Sea, Icmeler is in a truly glorious location. Plus, you can enjoy all of the activities of the nearby Marmaris, and then take a refreshing stroll back to Icmeler whilst taking in all of the natural delights of the scenery. Family friendly holidays: The more sedate atmosphere and the gentle waves of its coastline make Icmeler a great destination for family holidays. Although you can still expect a great choice of bars, including ones with dancing waiters and karaoke events! If you want a quieter relaxing holiday where you can lap up the sunshine on soft beaches, then Icmeler is the resort for you. Atlantis Park: Icmeler is just a short hop away from Marmaris, so you can always pop there to visit Marmaris Castle, which was once a battling ground of Alexander the Great. But maybe you might prefer some excitement in the water? Go to Atlantis Park. It’s a huge waterslide park situated between Marmaris and Icmeler – the ideal way to let loose and have some fun on your Icmeler holidays 2019. 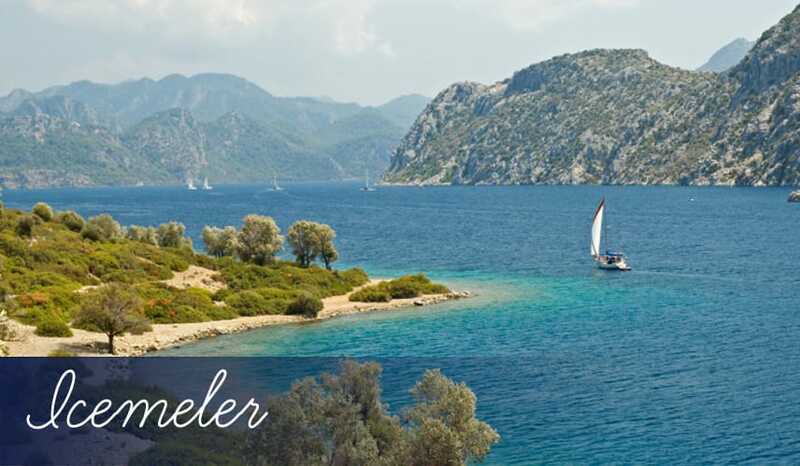 Icmeler beach: Icmeler holidays have one huge advantage over neighbouring Marmaris – the beautiful beach. The sand follows all the way around the edge of this enchanting coastal resort. It leads into the warm azure waters of the Mediterranean and is enclosed on all sides by pine covered mountains. Being such an attractive place, it’s incredibly popular with tourists from nearby resorts too and can get rather crowded in the summer holiday months. Still, that’s not much of a problem as the beach is very wide and long, so there’s space for everyone to enjoy the wonderful scenery! Marmaris beach: It’s not really recommended, but if you fancy a change of sandy scenery on your Icmeler holidays, you could always visit Marmaris Beach. The shoreline is much narrower, and the sand is a distinctly darker variety. Still, at least there are plenty of water sports here to keep things lively out to sea. Selam: Although Icmeler holidays mainly cater to the many British tourists who visit here every year, there’s also an excellent selection of authentic Turkish restaurants. A place like Selam actually perfectly encapsulates everything that’s great about Icmeler. Like brilliant British food? Not a problem, as you’ll find many classics here like liver and onions or steak and ale pie. Fancy something more Turkish? Go right ahead and be adventurous, as you can choose the delicious mezes or kebabs, all cooked individually by the talented chef. Love Star: This curiously named restaurant offers a wide range of meals inspired from all over the world. We’re talking about chicken curries, Turkish lamb, and Spaghetti Bolognese all crammed onto one diverse menu. You’ll ‘Love’ how attentive and friendly the staff are too! Florida: This bar/restaurant is one of the best places in Icmeler for breakfast. Sizzling bacon, fried eggs and buttery toast all come served hot and delicious. The more traditional meals like calamari and kebabs are available for dinner too. Clubbing holidays: Despite Icmeler focusing on family-friendly holidays, there are still a couple of clubs in the resort that stay open late. They’re further away from the hotels, so don’t worry if you’re wanting an early night. Pleasure club mainly plays r ‘n’ b until 4am, while Eastenders can also get pretty lively with the foam parties that are staged there. Party performances: Icmeler is filled with performers of every kind that’ll keep your holidays entertaining. From tribute singers to drag queens and dancing waiters, you’ll find lots here to make your drinking that little bit more interesting! Lively market: The market that’s held every Wednesday in Icmeler centre is well worth a visit. You’ll discover a real mish-mash of items on sale – everything from the famed Turkish honey to ornate ironwork. Shopping centres: Generally speaking, great shopping is something that Turkey holidays always offer and Icmeler certainly doesn’t disappoint. There are several mini malls dotted around the resort, as well as a main shopping centre featuring some big name brands you might recognize.